Entering and leaving a building, whether a hospital, bank, large store, school, airport or office block, was once something staff and visitors alike did without a second thought. It was access based on good faith and trust. Sadly, for an increasingly large number of companies and organisations this can no longer be the case. For larger organisations it isn't just entrances and exits that need to be controlled, but access within the building itself that needs to be addressed as lack of door security can pose serious problems. The solution is the installation of an effective, and simple-to-use access control system. 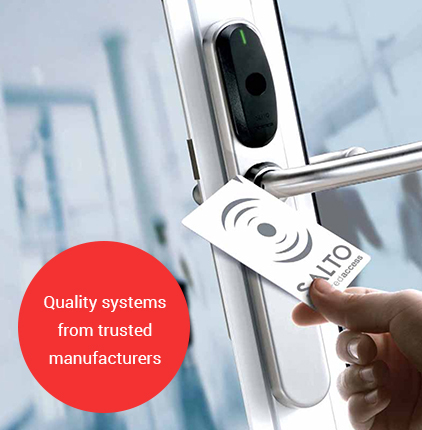 NASIC members can offer the full range of Salto products to ensure that your access control system suits your needs. Our work with industry leading manufacturers, allows us to provide you with quality solutions for taking control of the security in your property. our suppliers and how we work together to provide unrivalled security. Nortech offers a range of software that is easy-to-use and provides the perfect solutions for controlling and managing your access control system.